floatingsheep: Crowdsourcing Cake or Death? Following up on our recent trend of finding inspiration for our maps in various oppositions that we've encountered in our day-to-day lives, we turn today to the seemingly obvious question posed by Eddie Izzard: cake or death? While this should be a no-brainer for us, we thought we'd crowdsource the answer to this question, turning to the collective wisdom of the geographically-referenced tweet machine. We draw on a dataset of all geotagged tweets mentioning "cake" or "death" between July 2012 and March 2014 . Given that cake is so much more pleasurable than death, we expected Twitter references to show a similar preference. But the results might surprise you. Humans, apparently share a similar fondness for talking about cake and death. Extrapolating from our 10% random sample of global tweets, there are approximately 1,302,310 mentions of cake during this time, as opposed to 1,314,880 mentions of death. The death loving nations of the United States, Nigeria, Canada, South Africa, and India clearly stand out on the map. Cake, on the other hand, is a much more frequent topic of conversation in the UK and a handful of Southeast Asian countries including Indonesia, Malaysia, the Philippines, and Thailand. Among countries with a significant number of references to both cake and death, the Mediterranean countries of Lebanon and Greece, along with the Caribbean nations of Trinidad and Tobago and Barbados are the only ones that could be said to have found a nice balance between cake and death. The real question here is, why do some countries prefer death over cake? 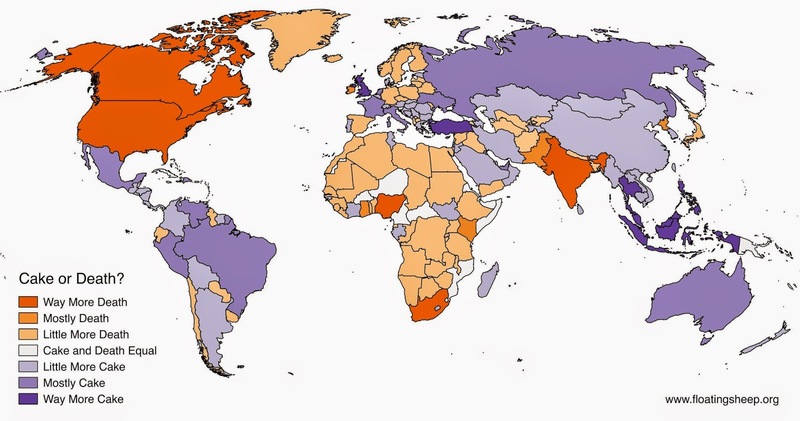 It is understandable that Canadians are locked in a deep cake-less existential crisis (we would be too if we lived there), while South Africa has one of the world's highest murder rates. But why is the US so infatuated with death? If we zoom into the world's most death-loving country, death is, well, pretty much everywhere around you. Death to everyone, indeed. 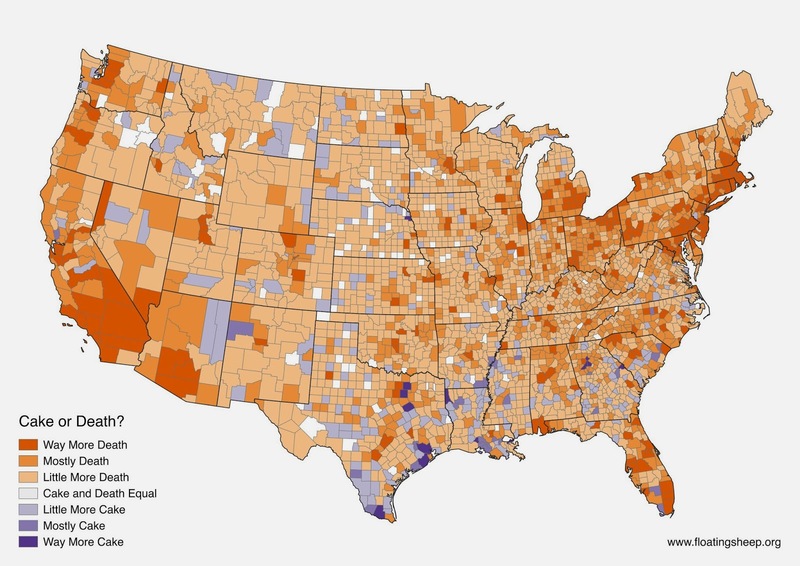 In absolute terms, there are a total of 162,205 mentions of death in the US, as opposed to 845,923 mentions of cake, but the geographic distribution of these references is all the more stark and, dare we say it, troubling. If you happen to live in or, god forbid, be passing through the post-industrial towns of Michigan, Ohio or Pennsylvania, or the BosWash megalopolis, death is really everywhere around you. From the frozen tundra of the north to the sunny retirement hotspots of southern California, Arizona and Florida, you can't really escape it. Yes, this is another missed opportunity from IronSheep 2014! This, of course, doesn't account for the fact that too much cake consumption will likely lead to obesity and then, yes, death.